The more time Jake Gerasch spent with his future wife, Michelle Girard, the more he began to change. That ring was put to good use on a hot and steamy July day in 2015, when Jake proposed to Michelle by the pond outside of Starlight Theater in Rockford. Her sister Kate, who is also her best friend, and Kate’s fiance, Andrew, were looking on. When it came time to pick a wedding venue to tie the knot, Forest Hills Country Club had everything the couple wanted and more. Forest Hills wedding receptions include a ballroom with seating for up to 280 guests, with unobstructed views, complementary use of all in-house audio and visual equipment, and an attached cocktail & hors d’oeurves reception room throughout the night. The ballroom’s drapery along the ceiling, with lights shimmering down, creates a beautiful atmosphere. Things were so organized and elegant at Forest Hills Country Club that the couple’s guests took notice. “We have heard nothing but compliments from family and friends about the staff, the food and the beautiful ballroom,” Michelle says. The couple had to plan their wedding 18 months in advance to lock in a June 24, 2017, wedding date at Forest Hills Country Club. The couple appreciated how helpful and professional the Forest Hills Country Club team was during the planning process. 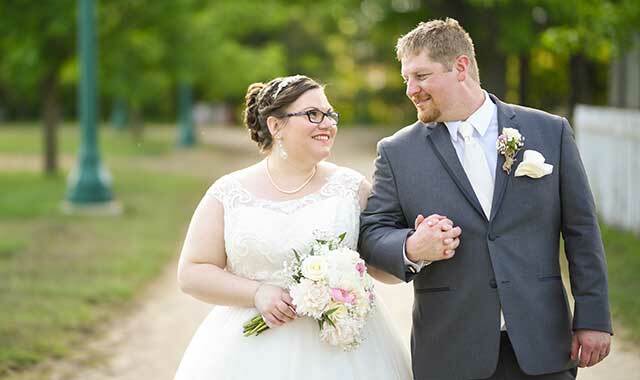 Flowers: Event Floral, Loves Park, Ill.
Bride’s Gown: Stella York bought at Brandi’s Bridal Galleriea, Etc., New Glarus, Wis.
Paul and Lisa Dailing prefer to make their own traditions, and that’s exactly what they did when planning their wedding. The venues they saw in the suburbs struck them as dull. What they liked in Chicago wasn’t affordable. Somewhere in the couple’s searching, friends and family started mentioning Burpee Museum of Natural History, located in Paul’s hometown of Rockford. The museum is well-known for its rich collection, which includes one of the world’s most complete juvenile Tyrannosaurus rexes. 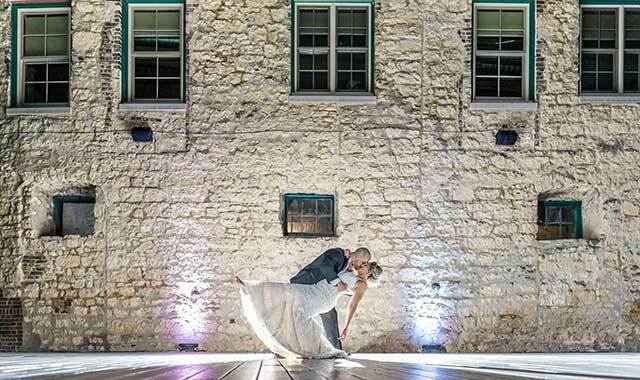 What the couple were about to discover is that Burpee has also become a popular location to host wedding ceremonies and receptions, with several settings including a 400-seat outdoor courtyard and a Riverview Room & Terrace that overlooks the Rock River. Paul remembered visiting the museum as a kid and volunteering there as a student. Paul met Lisa online and set a first date with the Lincolnshire native in early 2015. The magazine editor and school teacher quickly realized they’d found their match. A proposal came quickly. As they planned their wedding, the couple made several choices to buck tradition in their own unique way. Instead of a formal wedding dress, Lisa bought a lacy white dress and had a friend make her veil. Lisa’s father, a Cook County judge, led the ceremony. 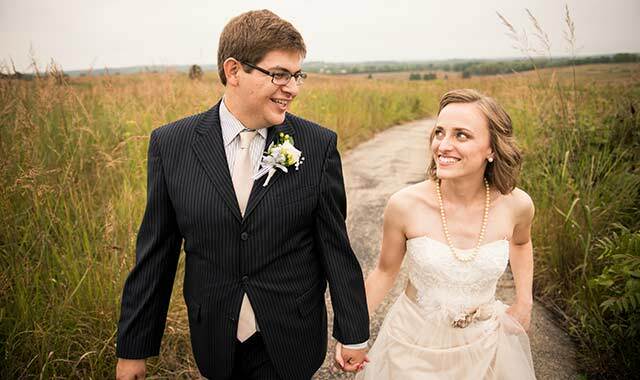 In many ways, Burpee Museum played perfectly to the couple’s personal style. They also found an important ally in Ciel Rheingans, who joined the Burpee team midway through Paul and Lisa’s yearlong engagement. Paul credits Ciel with being detail-oriented and quick to respond. Paul and Lisa were married in Burpee’s outdoor amphitheater on June 24, 2017. Their 120 guests enjoyed a cocktail hour while touring the museum and had fun collecting the copper spray-painted dinosaurs Lisa used for placeholders. 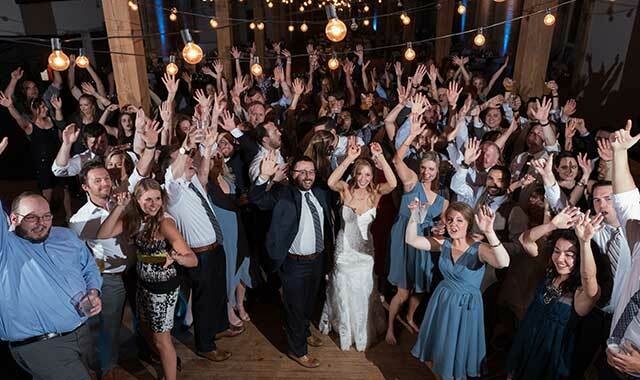 Reflecting on his own wedding, Paul offers just one tip for couples planning their own celebration at Burpee. For Jeremy Bloom and Michelle Casiello, a simple smile ignited a lifetime of love and happiness. The couple originally connected online, and when they met in person, they were attracted to each other’s smiles. The couple rented a condo in suburban Lisle, Ill., for about a year-and-a-half before the owner decided to sell it. On a cold day in December 2015, the day before Jeremy’s birthday, Michelle made dinner reservations in downtown Chicago. Michelle loves Christmas, so the couple also went to the Lincoln Park Zoo to see the Christmas ZooLights. Afterwards, Jeremy hijacked Michelle’s dinner reservations. What was supposed to be Jeremy’s birthday dinner became an engagement dinner, complete with champagne, personalized menus and rose petals. The couple knew they wanted to get married at a brewery, and they found everything they wanted at Prairie Street Brewing Co., in Rockford. The riverside restaurant and brewery has three rooms available for wedding receptions. The couple locked down their venue in January 2016 and were married on July 1, 2017. 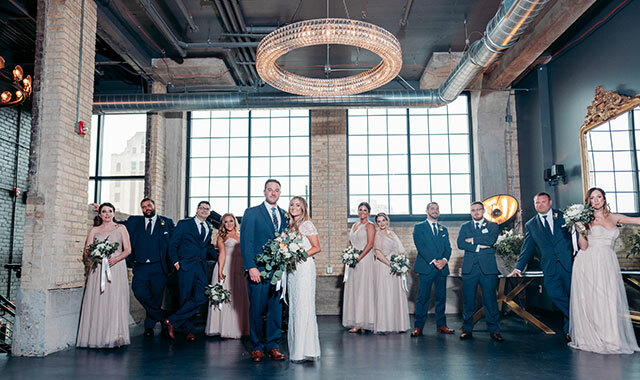 “We looked at a few breweries, and we liked Prairie Street Brewhouse because of its rustic, industrial look and the ability to hold our ceremony on the dock,” Michelle says. Prairie Street Brewhouse offers scenic river views and an old, industrial feel. The dock where Michelle and Jeremy held their ceremony was a gorgeous setting along the water. The building itself creates a wonderful backdrop to a couple’s perfect day. Michelle says the staff at Prairie Street Brewhouse was easy to work with. Since the wedding was at a brewery, it’s only right the couple had a beer-themed event. Michelle credits the Prairie Street staff for not only making the day run smoothly, but for inciting positive reviews from their guests. 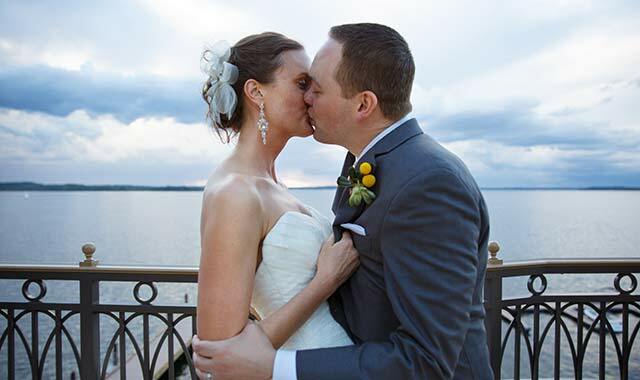 Officiant: Kevin Nielsen, Rolling Meadows, Ill.
DJ/Photo Booth: Luxe Productions, Loves Park, Ill. Photographer: Erik Anderson Photography, Machesney Park, Ill. 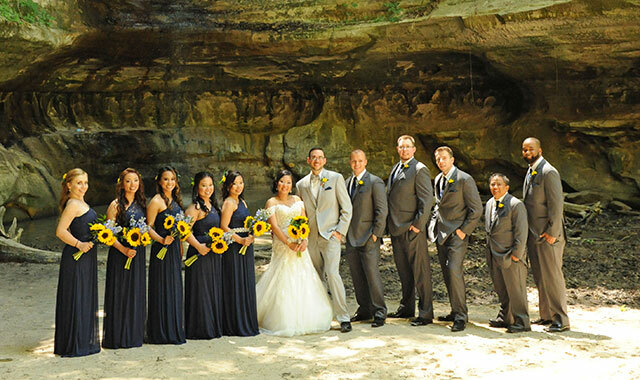 Bridal Party Attire/Wedding Dress: Jasmine Galleria, Lombard, Ill.
Hair/Makeup: Jasmine Galleria, Lombard, Ill.
Terah and Steve Holland usually dress casually when they go out to a restaurant, but something was unusual on the night of February 6, 2016. As Terah was getting ready for dinner, she noticed Steve was putting on a nice shirt and sport jacket. The couple, who met at medical school in an orthopedics interest group at Southern Illinois University, were about to leave for dinner when Steve proposed. 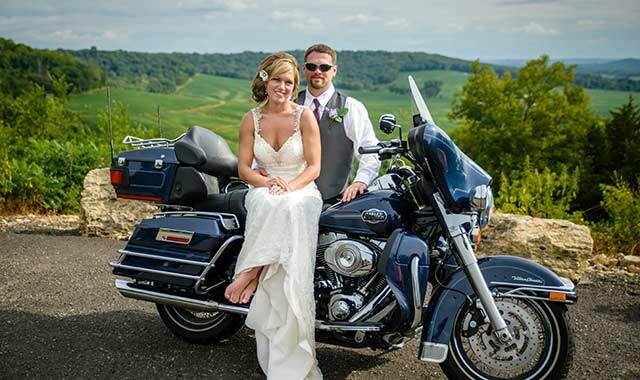 The couple wanted to get married somewhere close to Terah’s hometown of Polo, Ill. She has a friend who works in nearby Freeport and suggested the couple take a look at The Wagner House. “We went to check it out without an appointment and they were happy to show us around,” Terah says. What attracted the couple to The Wagner House was its industrial, rustic appearance. The three-story, former industrial warehouse was built in 1903 and was one of the first buildings to have electricity in Freeport. Today, it serves as a historically preserved urban oasis. 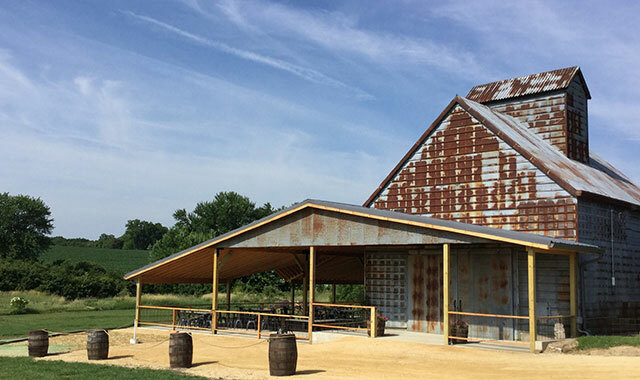 It also serves as Freeport and Stephenson County’s premier wine bar, meeting place and event venue. The couple tied the knot on May 6, 2017. They booked The Wagner House more than a year in advance to ensure they got the date they wanted. 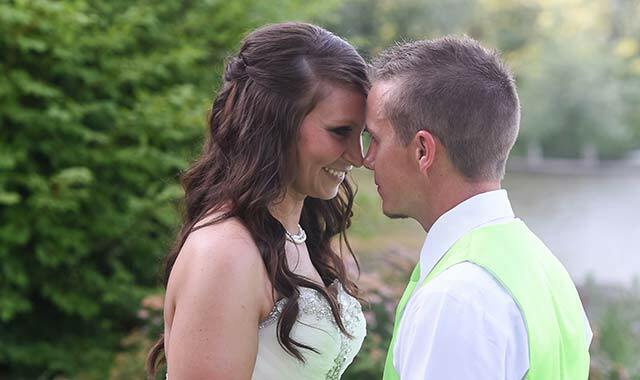 Looking back on everything, Terah remembers her wedding day as a success. Catering: Rafters Restaurant, Lena, Ill. Photography: Brian Adams Photography, Rockton, Ill.
Bride’s Gown: Martellen’s Dress & Bridal Boutique, Lemont, Ill.
Transportation: AAA Quality Limousines, Loves Park, Ill.
Love’s No Drag: Barnacopia, Polo, Ill.
Ceremony: St. Mary Catholic Church, Byron, Ill.
Limo: Hollywood Limo, Byron, Ill.
Hole in One: Woodbine Bend Golf Course, Stockton, Ill.
Iowa native Ashlie Stoddard never thought golfing at Woodbine Bend Golf Course, in Stockton, Ill., would lead her to meet her future husband – or find the perfect venue for her future wedding reception. But, after a few weeks out on the links, her fate was sealed. Sam Stoddard, a Chicago suburbs native and manager of Woodbine Bend, initially met Ashlie in Stockton while working on an economic development project. However, it wasn’t until Ashlie started golfing at Woodbine that the two started dating. 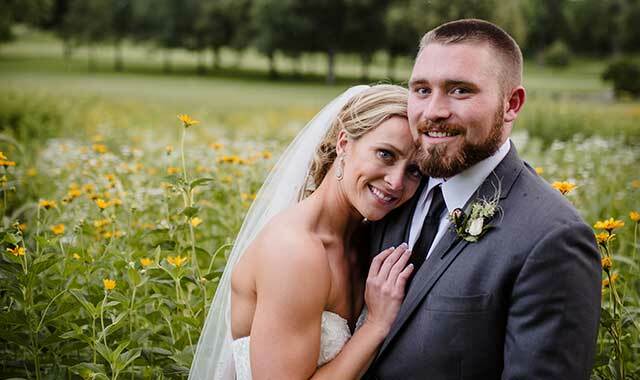 Two-and-a-half years later, Sam was kneeling in front of Ashlie in his home, ring in hand. The two were married in the Dominican Republic but wanted to have a reception in Stockton for family members and friends who were unable to travel abroad. Woodbine offers a banquet hall with a capacity of 180, but it also offers several outdoor spaces including decks and event areas on the course, making it an ideal venue for weddings and receptions year-round. Ashlie recalls spending the day looking over the beautiful hilly landscape, chatting with friends and family about the wedding, and listening to the flow of water from the nearby creek. Aside from the beauty of the venue, Ashlie believes a large attraction of a Woodbine wedding is working with the experienced wedding planner who alleviates stress from the planning process. The couple worked with Woodbine’s event planner to coordinate everything: tents and tables, food trucks, a fully stocked bar, a live band and yard games. “It’s easy to forget about some of the many elements that go into a wedding, so it was really nice to have a planner who could keep everything on track,” Ashlie says. Although Woodbine offers catering service, Ashlie decided to bring in food trucks so Sam and the Woodbine employees could enjoy themselves and not worry about cooking. Reception: Woodbine Bend Golf Course, Stockton, Ill. Photography: Through Ceara’s Eyes, Stockton, Ill.
Smitten at First Sight: Oak Lane, Oregon, Ill. Though Brittney lived in DeKalb, Ill., and Tom lived in Rockford, Tom knew after only a week that he wanted to someday marry Brittney. He proposed a couple of months later when the couple were on vacation in San Antonio, Texas. The couple began searching for a wedding venue immediately. 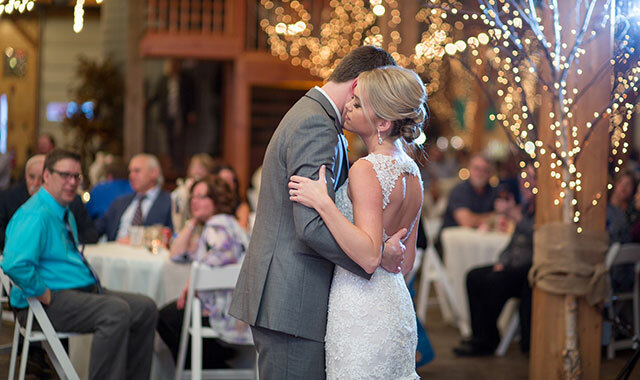 Tom’s sister recommended Oak Lane in Oregon, Ill. – a unique 1800s dairy barn remodeled into a chic reception hall. Set on 16 acres, Oak Lane offers five outdoor ceremony locations as well as an indoor space that can accommodate up to 180 guests. Receptions are held in the barn’s hayloft upstairs. 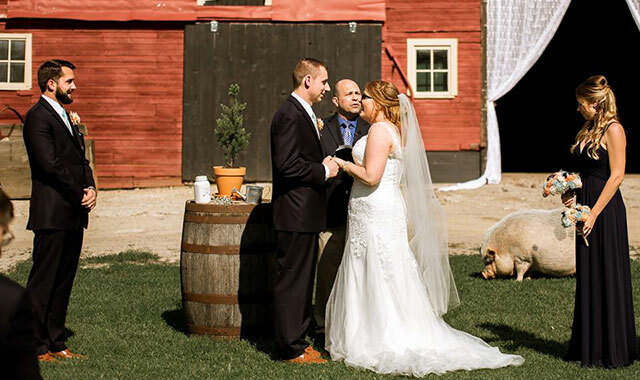 Adding character to the venue are two potbelly pigs, Baconette and Hambone; two llamas, Dilly Dally and Tessa; a Belted Hampshire sheep named Lucy and a lamb named Lambchop. Ceremony/Reception: Oak Lane, Oregon, Ill. Photographer: Bailey Lynn Photography, Oregon, Ill.
Cupcakes: Cakes by Dea, Marengo, Ill.
Sunshine-Filled Love: Rocky Waters Vineyard and Winery, Hanover, Ill.
On their first visit to Rocky Waters Vineyard and Winery in 2013, Andrew Richmond and Erinn Strauch fell in love with it. Through their next several visits, the couple learned more about the winemaking process, sampled more of Rocky Waters’ bottles and started to brainstorm ideas for their big day. It became an exciting process for the couple, who hadn’t previously known much about wine. In fact, Andy and Erinn were first drawn to each other because of their mutual interests in hunting and enjoying time outdoors, when they met in 2008 through friends. The picturesque vineyard, rolling hills and lush site next to the property’s lake was the perfect setting for two nature lovers to be wed. Of course, it didn’t hurt that Rocky Waters also made what became one of Andy’s favorite wines, the award-winning Cedar Lake Blush. They worked closely with Spahn over the next six months to plan out the rest of their ceremony set for Aug.16, 2014. By renting the venue’s fisherman’s cabin alongside the lake, they were able to schedule an entire weekend to relax and enjoy with their nearly 100 guests. Andy says photos of the cabin don’t do it justice. The relaxed atmosphere seemed to carry over from their engagement, when the couple spent a leisurely, private day at home, after Andy proposed in 2012. Spahn also set up a tractor-pulled wagon to transport guests conveniently from the parking lot to the wedding site and back, touring through the vineyard’s charming views. The reception was later held at Gil’s Ballroom, in Clinton, Iowa, with close to 200 additional family members and friends. A Fresh Face Forward: Byron Forest Preserve District, Byron, Ill.
Raul Leon has witnessed many happy moments in his career. 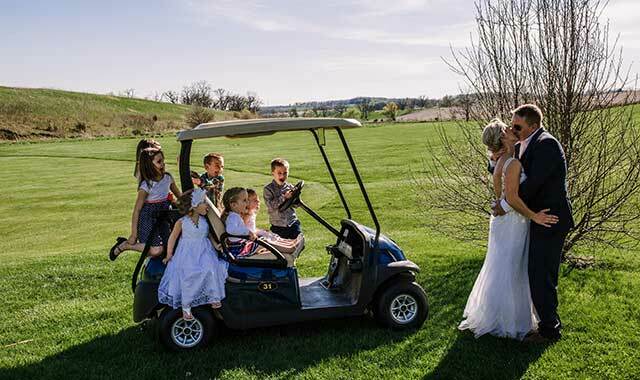 The facility manager for the Byron Forest Preserve District, in Byron, Ill., has seen marriage proposals, engagement photos, rehearsal dinners, wedding ceremonies and wedding receptions. The newly renovated main-floor museum of the Jarrett Prairie Center can hold up to 110 people, while a new deck, overlooking 450 acres of prairie, can seat an additional 150 people. The lower level of the Jarrett Prairie Center can accommodate up to 180 people for rehearsals, ceremonies and receptions. In addition, the pavilion at PrairieView Golf Club can accommodate 200 people. At both the golf club and the Jarrett Center, couples can access bar services, ample parking and kitchen facilities. 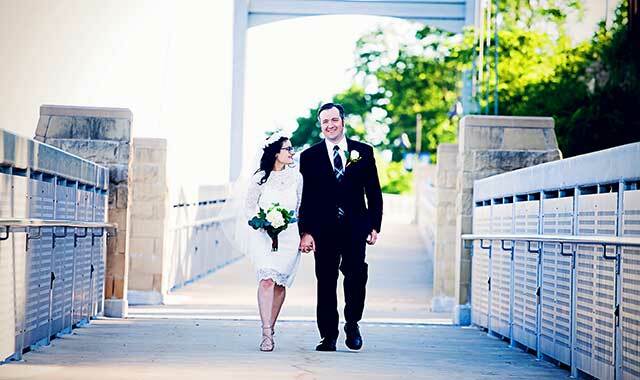 And, they can take advantage of photo opportunities in the many outdoor areas that include a wooden bridge and stage. He recommends booking at least 30 days in advance, however, accommodations can be made as far as a year in advance or at the last minute – if space is available. Jessica Hohler had a crush on Joe McCuen in middle school. Unfortunately, Joe was more interested in skateboarding than girls at that time. The two lost touch in high school when Joe’s family moved away from Belvidere. Years later, Jessica was pleasantly surprised when Joe sent her a Facebook friend request. Jessica knew exactly what she wanted with decorations, but the Hilton Garden Inn staff surpassed all of her expectations. The hotel setting was also ideal for the McCuens’ guests, since no one had to travel after enjoying an open bar experience. A variety of wedding packages are available at Hilton Garden Inn. All come with room setup, hors d’oeuvres, a champagne toast and cake cutting. The McCuens opted for a package that included dinner and an open bar. This entry was posted on Thursday, August 24th, 2017 at 12:00 pm	and is filed under Northwest Woman, Top Posts. You can follow any responses to this entry through the RSS 2.0 feed. Both comments and pings are currently closed.